As he sets out to lead the way in rebuilding the North Bay after the October wildfires, Sonoma County developer, newspaper owner and Democratic Party power broker Darius Anderson’s Platinum Advisors is also lobbying on behalf of PG&E’s post-fire interests in Sacramento. 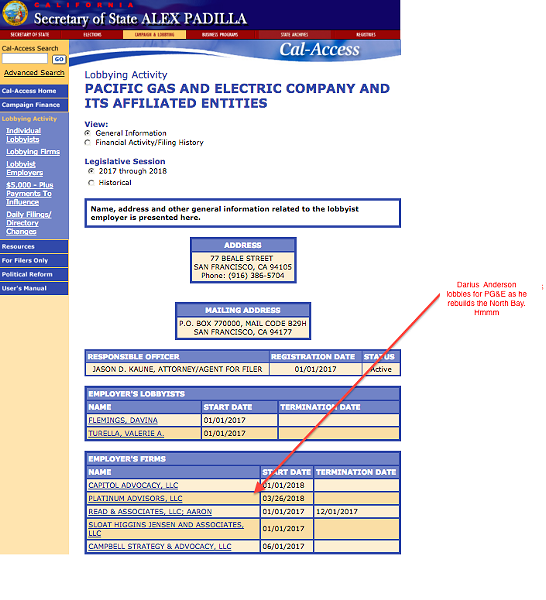 According to the California Secretary of State (see graphic above), Platinum Advisors was hired by the utility on March 28, just as a Senate bill that’s squarely targeted at PG&E’s fire liability was scheduled to make its way through the committee process in the Senate. Sponsored by a quartet of state senators, including North Bay pols Bill Dodd and Mike McGuire, SB 819 sets out to limit the extent to which electric utilities can pass off fees and fines to ratepayers. The current regulations prohibit gas corporations from “recovering any fine or penalty in any rate approved by the commission,” and SB 819 extends that prohibition to gas and electric corporations such as PG&E, which is based in San Francisco, provides power to some 16 million California residents and is the dominant investor-owned utility in the state. SB 819 would in effect head off PG&Es attempt to convince Sacramento lawmakers that fallout from the “new normal” of wildfires shouldn’t fall on the utility, even if its equipment is determined to be the culprit. Two state agencies are investigating the fires and no final determination has been made about PG&E's ultimate responsibility for the fires, if any. PG&E is opposed to SB 819. The bill was set for its first committee meeting today, April 17, before the Senate’s Energy, Utilities and Communications committee. McGuire’s a member of the bi-partisan committee. The bill was introduced on Jan. 3 and the Senate set today’s hearing date date on March 12. Platinum Advisors was hired by PG&E two weeks later. The company was founded by Anderson, a Sonoma resident who is also the principal owner at the Sonoma Media Group (which owns the Press-Democrat), and the founder of the Rebuild Northbay Foundation, a nonprofit he created after the fires. The utility has come under intense scrutiny following the wildfires last fall as state investigators set out to determine what caused the fires which destroyed thousands of homes and buildings, killed dozens of people, and prompted around 300 lawsuits against the utility—including a suit by Sonoma County itself. Sonoma County Supervisor James Gore’s wife, Elizabeth, is the chair of the Rebuild North Bay Foundation. The North Bay fires caused an estimated $9 billion in so-called "insured damage." Numerous press reports have noted that PG&E carries about $800 million in liability insurance. The takeaway: The investor-owned utility is facing one of the more severe existential crises in its hundred-plus year history, and says that SB 819 could not have come at a worse time for the utility or its ratepayers—especially given its commitment to participating in the state’s climate-change reduction strategies. PG&E put the heavyweight Sacramento lobbying group Capitol Advocacy on its payroll as of Jan. 1. It added more lobbying firepower with the addition of Platinum Advisors about two months later, as the legislative session got rolling. Anderson was not immediately available for comment via email or phone.